What Was the Pharisees’ Mistake? Yesterday was Transgender Day of Remembrance 2015. I observed this day because I recently learned that my 27-year-old son is transitioning to become my 27-year-old daughter, which she says more clearly matches who she really is. I was pretty shaken by the news, but fortunately, she got to tell me in person, so I could feel in my heart that, regardless of gender, this is still the person I love with all my heart. Their essential being hasn’t changed. I haven’t lost my child. This news came last summer. 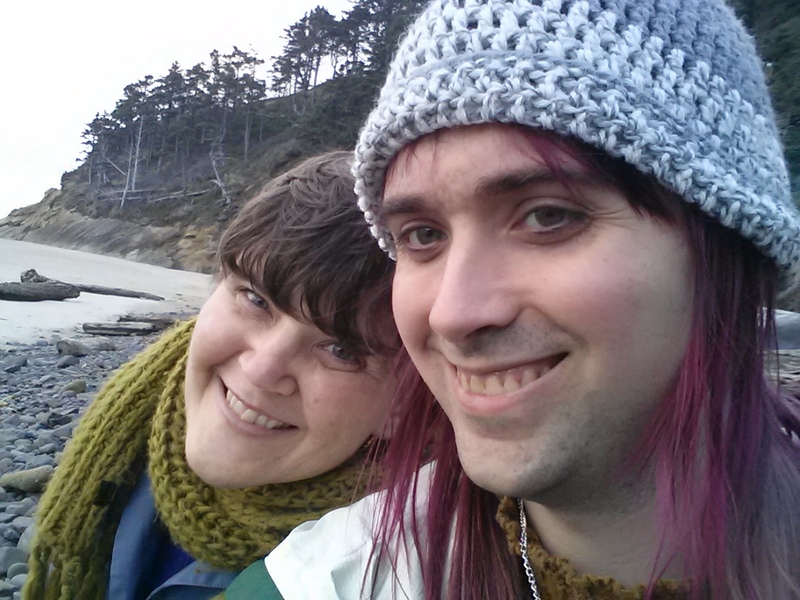 Last week, I got to spend some time with my new daughter in Portland, Oregon, and with a trip to the Oregon coast. It was a lovely, wonderful time. She is very happy about transitioning. And I still think she’s one of the most wonderful people God ever created. Not all my friends and family members, however, think I should be happy that my child is happy. After all, they are absolutely sure the Bible teaches that changing gender is sinful. They say the gender you appear to be at birth is what you are, because Adam and Eve were male and female. Therefore I should not “go along” with my child’s sin, and I should not “give in” and call them by the new name they have chosen. Meanwhile, I joined a Mom’s Facebook group for Christian mothers of LGBTQ kids. My transgender daughter is an adult. But many of them have children who are being given messages that they are an abomination and evil. Many tried and tried with prayer to change who they are, only to despair. I’m coming to think of this not as a simple expression of intolerance but of active harm. However, though I strongly disagree with their interpretation of Scripture, I feel like I do have some sympathy. I can remember what it was like to look at the world — and the Bible — that way. You see, I was a teenage Pharisee. Okay, I was also a child Pharisee and an adult Pharisee. I grew up in a loving Christian home. We went to an evangelical church, and I accepted all the teachings from an early age. I thanked God that I was born into a home where I was taught the Truth. Too bad that everyone who didn’t believe this was going to hell. But it was what they chose by not believing the Truth. I went to a Christian elementary school. I started in third grade, which was where I met two dear friends who are still among my very best friends today. I went on to a Christian high school and a Christian university. We signed statements of faith as well as codes of conduct where we agreed that we would not do shocking things like smoke, drink alcohol, or dance. And I was happy to sign. Like a good Pharisee, I memorized Scripture — the entire New Testament, Psalms, and Proverbs. Now, the real reason I could give significant time to it was that my parents paid me, but I do have to say that memorizing Scripture did me good in spite of myself. Filling my mind with Scripture got it into my heart. And I still love the Bible today. I married a good Christian man — a fellow student from the university. I was all set to live a good life, pleasing God. Don’t get me wrong — I knew there would be “trials,” but God would get me through. We’d be a nice Christian couple and raise a nice Christian family. And I wasn’t even tempted to bend the rules. No smoking, drinking, or dancing for me, even if I hadn’t signed a code of conduct recently. Some of the Pharisees said, “This man is not from God, for he does not keep the Sabbath. My heart goes out to the Pharisees. They thought they had it all figured out. They thought they knew how to please God. They thought they had all their ducks in a row. They got things in black and white, and they didn’t have to guess if they were doing it right. They knew who was right with God and who was a sinner. They thanked God that they weren’t like those sinners. Hmmmm. Kind of like me. That rule, which they’d all worked out? He said it wasn’t the end-all and be-all. Now, when I was a college student, I used to wonder when my professors presented me with a detailed chart of how the end times were going to go. It seems to me that God doesn’t like to be predictable. Jesus fulfilled prophecy — but he certainly didn’t fulfill it the way those who’d received the prophecies expected the Messiah to fulfill them. What if God was going to deal with prophecies of the end times the same way? What if they aren’t given to us so we can know in black and white exactly what will happen? What if we just need the message of who is going to win? But I still didn’t see it with the Rules. God lays out in his Word what’s Good and Bad, what’s Right and Wrong. A good Christian believes that and follows those Rules. A good Christian does their best not to sin. Gradually, over the years, God eased me out of being a Pharisee. He ever-so-gently showed me that maybe the point isn’t the rules, but loving God and loving your neighbor. One of the earlier things to shake me up was reading George MacDonald, a nineteenth-century preacher. George MacDonald clearly loved the Bible and read it in the original languages — yet he seemed to be teaching that All would (eventually) be saved. How could he believe the Bible, yet teach that? So — how astonishing that the interpretation of the Bible that I’d grown up with and believed was the Only Saving Truth — was not at all the only possible interpretation, and that there was even one that seemed much better and much more in harmony with God’s love. Now I still believe that everyone comes to God through Jesus, but that your chance to trust him doesn’t end at death. I believe that hell isn’t punishment, but correction. And though it lasts for eons (the word used in the Greek), it doesn’t last for eternity. Hell is not senseless, unending vindictive torture. Hell is the length to which a loving God will go to bring his children back to himself. But wait — that means those people I believe are horrible sinners are going to wind up in heaven with me. Okay, that shakes up my way of looking at people. That means maybe God will bring other people to himself using a different path than the one that led me to him. And . . . just maybe . . . it’s possible that sometimes my interpretation of Scripture is wrong. George MacDonald also cautions his readers against putting their trust in the Bible, when our trust should be in Jesus. Because we aren’t reading the original language, and even if we were, our interpretation can vary. It seems to me, that’s what the Pharisees did. Now, in the case of lesbians, gays, bisexual, transgender, and queer people — there are definitely other ways to interpret the Bible. Here’s a nice link with an alternative view. Or there’s an outstanding book written by an Episcopal bishop, God Believes in Love. The commandments, “Do not commit adultery,” “Do not murder,” “Do not steal,” “Do not covet,” and whatever other commandment there may be, are summed up in this one rule: “Love your neighbor as yourself.” Love does no harm to its neighbor. Therefore love is the fulfillment of the law. It seems to me that if your interpretation of Scripture results in actions that don’t seem very loving — maybe there’s something wrong with your interpretation of Scripture. Do we really want to put more faith in the Bible — or our interpretation of it — than we do in Jesus and his Spirit who lives in us? Shouldn’t we be concerned when we know beyond a shadow of a doubt that what someone else is doing is sin? You are right when you say you have no husband. The fact is, you have had five husbands, and the man you have now is not your husband. What you have just said is quite true. Do you hear a word of condemnation in that? (She didn’t seem to. She changes the subject but continues talking with him.) Sure, I hope for her sake that she found real and lasting love later in her life. But at that moment? Her lifestyle, sinful or not, is not the point. Jesus loves her and wants to give her living water. Now, brothers and sisters, I’m trying to be clear that I can easily remember thinking very differently about this. I’ve gone more quickly down this path because now it affects one of the people I love most in all the world. But it does make me sad that my new daughter doesn’t naturally look to Christians for love and acceptance. And it makes me sad that Christians aren’t urging me to love my kid all the more. Does my interpretation of Scripture fit with the principles of mercy, love, and faithfulness in this matter? In what ways can I love my lesbian, gay, bisexual, transgender and queer neighbors as myself? Am I straining out a gnat but swallowing a camel? And to any lesbian, gay, bisexual, transgender, or queer people who may be reading this post: God loves you. You are fearfully and wonderfully made. And that, Dear Reader, includes you. You are currently browsing the Sonderjourneys blog archives for November, 2015.